But as far as actual action to restrict gun rights on the federal level, not much is imminent or moving. Congress and the new president are very, very busy spending the U.S. further into hyperinflation or bankruptcy and figuring out exit strategies (or not) from Bush-era foreign policy entanglements. While Justice Department's focus on enforcing existing gun laws may well increase, we're unlikely to see any significant new federal efforts that infringe on the Heller-certified constitutional right to own common weapons for self-defense in the home. The gun rights community, in other words, is most likely wrong about the extent to which the Obama administration will try to restrict gun rights. (Not that, even in a post-Heller age, they don’t have reason to be worried; short of D.C.-style total gun bans, lower courts so far seem sure that any other gun regulations go under the ruling.) The political irony is that being mistaken about the magnitude of the threat can guarantee they achieve their goals—being wrong, especially convincing the gun rights rank and file to grossly overestimate the Obama threat, will help ensure that the threat never becomes real—even if it never would have. In the face of an administration that undoubtedly only respects gun rights to the extent that its supporters have the political power to harm it, gun rights forces do need to keep their powder dry; perhaps even excessively stocked. Paranoids may not always have real and effective enemies, but in politics, as in life, paranoia can keep you safe. I'm hearing that ammo is trickling back into the retail pipeline. AIM Surplus has Russian 5.56...as they say in country music, it ain't love but it ain't bad. If you want to break the budget, Midway USA has Black Hills Match — wonderful ammo — at a bit over $700 per thousand. There's off-brand 9mm around as well. J&G is quoting Glock 17/34 9mm mags in stock...I'm gonna order a few and see what happens. As I mentioned earlier, I ordered an FNH USA FS2000 bullpup (above) because I've gotten curious about the bullpup platform. Knowledgeable people either love the things or absolutely positively hate them. I've shot the 2000 a bunch at the range and generally like it...not as much as the new flat-top AUG, but it seemed to me to be a good, serviceable carbine in a small package. I thought it might be fun to spend some time shooting a bullpup and doing some video. I got the Para GI Expert back from Para after I asked them to address the FTF issues I had on the first firings. Not surprisingly, the gun now works super. As I mentioned before, this el cheapo 1911 was superbly accurate but stuttered like some of my 1970s guns...one of the drawbacks of getting the third gun off the line. It's now 100%...engineers tell me they replaced the hammer and sear. I still believe this is one heck of a platform for the 1911 of your dreams or, if you're like me, SASS Wild Bunch competition right out of the box. BTW, I'm breaking in an IWB holster for my Carry 9 from John Ralston at 5-Shot Leather...as I mentioned on Twitter at SHOT, it is a beautiful, intelligently designed holster...the two separate belt loops allow the holster to be positioned over the belt loop on your pants, the ideal place for an IWB on most jeans. I also just got a beautiful leather Ching sling from Andy Langois at Andy's Leather. Andy's the premier maker of Ching slings in the country and he does what amounts to heirloom work. You're probably not familiar with his leatherwork because he's one of those "secret" holstermakers that the expert trainers and people who actually use this stuff to stay alive keep pretty busy. So I strongly suggest you visit his site and if you're in the market, order now! I spent a bunch of time with Andy and my old pal Tim Craft at SHOT.,..it was big fun. 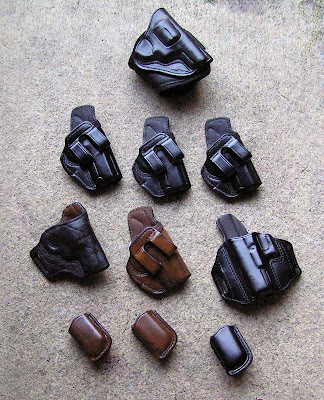 I'm actually going to commission a couple of rigs from Andy, including a Ruger Blackhawk "concealment" holster for the Ruger single action self-defense class at GUNSITE in a couple of months. 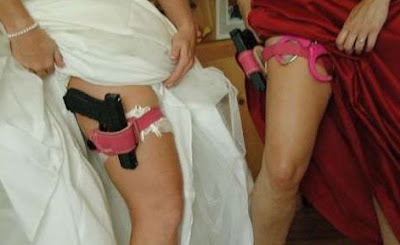 And besides, how many other top makers will do a Glock garter holster in pink? So I'm trying to wake up this AM before a short day of filming. Couple of things on the DRTV front...we (or rather Marshal) are starting to get up clips from THE BEST DEFENSE. Hopefully, we've cleared all the hurdles to put up (and maybe offer for sale) some back episodes of COWBOYS and SHOOTING GALLERY, all part of our new relationship with OUTDOOR CHANNEL. I'm also looking at some of the original videos...right now I'm hindered by, dud, winter! It's way cold up at the secret hidden bunker. I'd have to go pretty far south to do some filming. I'll figure something out. I want to spend some time with a bullpup carbine, because they generate such love it or hate it emotion. While I really liked the new Steyr AUG at SHOT, I plan to T&E an FNH USA FS2000, which I've shot a bunch at various events. The big plus for the FS is that it takes standard AR 30-rounders. I notice that the market in some areas is catching up with the demand...AR mags and Glock 17 magazines, as commenters have pointed out, now seem to be available, at least in a few place. Several of the big houses are quoting popular ammo back in stock, albeit at higher prices. The fear is that, politics aside, there's an inevitable big dip on the other side of this sales frenzy as an entire year's worth of money is sucked out in the first couple of months. In talking to NRA museum head Jim Supica, he noted that antique and collector gun were suffering, with some of the big auction houses reporting sales below the low end of the anticipated bids. In other words, if you've ever wanted a classic gun, there will probably never be a better time for that purchase...after, of course, you AR is safely in your safe! Spent the last couple of days sleeping late and trying to reboot after the SHOT Show and assorted dental work. As a result, I feel almost human...emphasis on the "almost." Yesterday I went out and bought a couple of pairs of cowboy boots, a sturdy pair of Ariat work boots and a flashier pair of Tony Lamas for cowboy action shooting. Finally wore out my old Dan Post everyday boots...waded through ankle deep-mud and snow one time too many, I suppose. Anyhow, I was going to write a word on the temperature of the industry post-SHOT. I'd say the word is "unsettled." 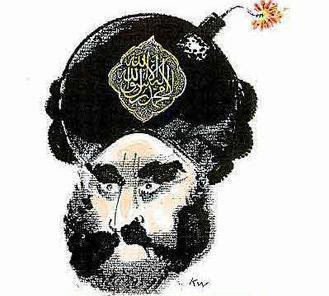 Half the industry is convinced there will be an Assault Weapons Ban (AWB) tomorrow afternoon; the other half convinced that the Blessed One will be too preoccupied trying to restart the economy, personally tracking Osama to his lair and, on the side, keeping the Israelis from solving the Middle East problem with a cleansing application of fire. As most of you know, I come down closer to the "tomorrow afternoon" group than the "preoccupied" guys, in part because I'm baseline paranoid, but also in part because the AWB is what it is...something symbolic to the left, akin to those religious totems always being dug up in Eastern Europe, bones of the saints and such. Even the dimmest liberal — although surely an oxymoron — understands that AWBs don't actually ban "assault weapons," have no effect whatsoever on crime (as the sunsetting of the old AWB proved conclusively), will rally the progun forces at a previously unprecedented level, and send waves of unintended consequences ping-ponging through the culture...which is how bHO became the most successful gun salesmen in history. But it's the old scorpion and frog joke — the scorpion stings the frog carrying him across the river, even though the scorpion will drown, because, hey, it's what scorpions do. Remember, the belief in the endless panoply of antigun "solutions" is religion, not logic. One of the reasons that debating firearm issues with antigunners is futile is that there is no logic involved on their part; might as well argue the number of angels who can dance on the head of a pin (the correct answer is six, including the really hot Eastern European one). If I'm wrong, I got a bunch of extra 5.56 and plenty of magazines. So what? I believe buying an AR, extra mags and ammo is an act of patriotism, exercising a fundamental right. Secondly, every new black rifle owner — thank you, President bHO! — brings another voice more profoundly into the fight. If I had it in my power, I'd wave my magic wand and give every gun owner an AR, 10 mags and 1,000 rounds of ammunition...although we seem to be getting there without my magic wand. More is better when it comes to political realities. I believe that should the Democratic scorpions sting their Blue Dog frogs and go forward with an AWB, there will indeed be a Heller argument made against the new bill, something along the lines that military-styled black rifles are now the most common, most prevalent rifles in America, making it Constitutionally harder to ban them. Future Supreme Court panels and lower courts might develop all manner of criteria for placing particular guns outside the protection of the Second Amendment. This possibility complicates the defiance decisions of private citizens, and those decisions affect the viability of gun regulation outside the core of protected firearms. One methodology legislatures might use to push categories of guns outside the boundaries of constitutional protection is the bad gun formula. It was used to advance the 1994 Assault Weapons Ban. The argument was that assault weapons were peculiarly dangerous and removing them from the inventory would not impair legitimate interests. The forward risk created by this form of line drawing is that every type of gun has its peculiarly dangerous characteristics. All guns are deadly and, ultimately, might be characterized as especially dangerous under the bad gun formula. 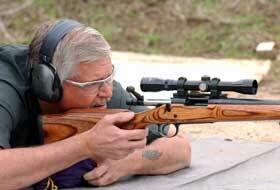 Within twenty yards, nothing is more devastating than the shotgun, and it can be easily sawed off for concealability. The long range precision capabilities of the scoped bolt action rifle make it dramatically more deadly than any alternative on distant targets. These rifles are ballistically superior to other portable weapons—characteristics that have prompted some to label these ordinary hunting rifles “sniper rifles,” and to press for laws banning them. The semi-automatic assault rifle, though typically chambered for a lower-powered, less- deadly cartridge than most deer rifles, can fire multiple rounds before reloading and can be more portable than standard hunting rifles. 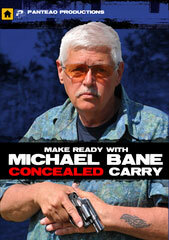 Concealability makes the handgun a weapon of surprise, opportunity, and last-ditch defense. These distinct utilities might be the foundation for denying constitutional protection as circumstances evolve. They will also fuel defiance decisions in spite of nominal constitutional protection. For people who recognize a danger of confiscation with respect to peculiar categories of firearms, the incentives to defy registration, secondary sales, or other recording statutes should continue. This is especially true for people who judge particular categories of guns to have no acceptable replacements. The “dangerous and unusual” standard seems to be aimed at saving federal restrictions on civilian possession of machine guns. But all weapons are dangerous, and any weapon that is banned (such as the guns arbitrarily prohibited by the “assault weapon” law) will thereby be rendered unusual, which makes Scalia’s reasoning circular. In any event, the “dangerous and unusual” exception, along with Scalia’s more general statement that “the right secured by the Second Amendment is not unlimited,” will provide grist for gun debates (and fund raising appeals) for many years to come. BTW, the Richard Feldman mentioned in the Reason article is the very same person who has gone on record on other forums stating that "Michael Bane" is a pseudonym for a famous Washington antigun lobbyist...probably quite a surprise to the people who waited in line for my autograph at SHOT! (Carolyn) McCarthy's tone of righteous indignation and utter horror at the Gillibrand choice stems from the fact that McCarthy's political career was launched, as things so often are these days, by high-profile victimhood. In this case, McCarthy, a political novice, lost her husband in 1983 to one of those horrific random-shooter-massacre incidents that occur far too often in America. She was elected to the state senate on a gun control platform. One can identify with the burning need to do something, anything, after such an untimely loss, but what has always been so wrong-headed about McCarthy's political career is that the Long Island Railroad Massacre would be many peoples' nomination for an incident illustrating the basic injusice of many gun control laws. The Long Island Massacre is certainly not a slam-dunk illustration of why gun control works. On an evening in 1983, tired commuters were dozing on their way home from New York City. Suddenly a respectable looking man in a business suit rose from his seat, pulled out a 9mm pistol, got up and began strolling down the aisle shooting. With no one to oppose him, he was able to reload three times. When he stopped to reload a fourth time, three men were able to wrestle him to the floor. By the time this happened, however, 25 people had been shot; six would die from their wounds. Colin Ferguson, for that was his name, turned out to be a complete lunatic, but the kind who masks his lunacy very well. The gun was purchased legally in California and he had undergone a fairly stringent gun control process to buy it, even waiting for a fifteen day so-called "cooling off period" between the time he applied to buy the gun and the time he picked it up. It's hard to think of ways to keep a Colin Ferguson from getting a gun short of a massive federal effort to outlaw guns everywhere and search people virtually every time they step into a public place, but if a few other passengers had had concealed handguns, Ferguson wouldn't have been allowed to stroll calmly the length of the train car, selecting targets like some kind of connoisseur of killing. And now Carolyn McCarthy is set to come sweeping back. I hope this time people will take the time to review what happened on that commuter train on that evening in 1983. ..but then, is that a surprise? Had a blip on THE BEST DEFENSE this week...a chunk of the "Choosing a Defensive Handgun" segment got lopped out for various and sundry reasons. The part that was whacked was me talking about how we all carry J-frames, really. What I've decided to do is run the entire segment on DRTV...we're working on encoding the video now, but it'll still be a couple of days. Stay tuned! Did I mention I have a G26 Baby Glock on the way? I've got a G34 and a G19 and I wanted the complete set. I've also got a bunch of 33-round 9mm magazines, and if you have a 9mm Glock, so should you. They're around; the G17 mags are gone baby gone, at least for a while. Because Glocks are what they are, the most common semiauto in the world. Plus, they can be maintained and repaired by a talented spaniel...after all, I am a certified Glock armorer! "Outgoing President George Bush and incoming Vice President Sarah Palin congratulate new Undersecretary of Black Rifles-Designate Michael Bane on his Cabinet-level post. 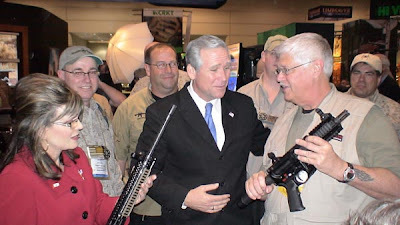 To the right of President Bush, Spike's Tactical President Michael Register beams at learning Spike's Tactical has been chosen the Official Black Rifle of the Inauguration." Probably the first time you've laughed in 24 hours, right? Let me tell you what's really happening in the picture...Mike Register and the guys from Spike's Tactical enlisted the Bush/Palin lookalikes to present me with two SPECTACULAR guns — a totally custom Spike's AR-15 5.56 carbine and an equally trick 9mm AR-15 pistol! Spike and the guys took this extraordinary step to thank me for my support over the last year or so. Hey guys, I have supported Spike's Tactical because you not only build the best AR-15 lowers and accessories in the business, but you have done so while retaining your off-beat sense of humor and spirit fun. Hey, we all do this because it is fun, not because we're living in some secret hidden bunker in the Rocky Mountains...whoops! YOU GUYS DESERVE THE AWARDS! And, of course, you'll be seeing a full video report on the 2 guns on DRTV as soon as my FFL guy has them!!! BTW...I had to pry the rifle out of the faux-Sarah's hands after the ceremony...a little too real for me! So, finally, we come to the worst case. We peacefully turn the reigns of power over to a cadre of people who envision an America that so many of us find appalling, an America that I believe in my heart the Founders struggled to prevent from ever happening. As a person who counts Dr. Martin Luther King among his personal heroes. as a person who grew up in Memphis in the bad old days of segregation, who vividly remembers the sound of gunfire in the streets, a part of me thrills to see this last great color barrier broken. But I can't help but think what Dr. King might think of a man who got ahead by going along, a man who by his actions condoned terrorists, crooks and thieves and benefited from their largess; a man of facile words, not deeds. I pray that I am wrong. As has often been noted throughout history, times more often make the man rather than the opposite. The gathering storm around us has already broken, and the old horsemen of depression, war, race hatred and the slaughter of innocents ride again. It will take an exceptional man to guide America though this maelstrom, and I fear we have not elected that person. For our part — those of us who profoundly and fundamentally believe that the Second Amendment is the defining plank of American liberty — our time of testing has come. It is important to remember that we have stood here before; we have seen the dark days come, and we have seen them go. We must truly, as the new President said, remain true to our forbearers and to our founding documents, because I fear he will not. We must be strong, because those who hold public office will likely be weak. We must be focused because surely our enemies will be. So, to paraphrase our new President, today we must pick ourselves up, dust ourselves off and rededicate ourselves to the remaking of America, an America that guarantees the benefits of liberty, including the fundamental right to bear arms, to our children and grandchildren. We are united; we are strong; we are focused...and we will stand. So get through today as best you can, secure in the knowledge that our best days are ahead of us and that the strength of our culture — and it is a separate, and better, culture — is our unity. "YOU MAY BE A TALIBAN IF...."
have uses other than setting off roadside bombs. every man should own at least two. Am back from SHOT 2009! I want to spend the rest of this week on the blog trying to put stuff into perspective. Not a huge amount of innovation this year...it was another SHOT where the industry was standing pat. There's was surprising amount of optimism mixed with the fear, which is a good thing. The transition to a tactical market is clearly complete...as one wag said, you couldn't swing a dead cat on any aisle without hitting an AR or accessory. The other big news was the ascendency of the once-lowly .380 cartridge. Am traveling today to Mouse World. Hopefully tonight I'll have dinner with Paul Erhardt and Jim Shepherd and get a sense going into SHOT on the temperature of the industry. Logistically, we're going to cover this SHOT differently than DRTV has done the last couple of years. Marshal and Marshal'ette will be in Orlando handling the video upload chores both for DRTV and for OutdoorChannel.com, both of which will go live tomorrow. We're going to be working with Outdoor Channel film crews starting tomorrow at Media Day at the Range and continuing through the Show, uploading to SHOT SHOW TV and to the Internet. I'll be trying to pigeonhole industry leaders on their view of our immediate future as well as working the new products' beat. We're also going to be uploading material to the DRTV SHOT Show blog (live tomorrow), including written reports, photographs, video and audio posts. We've opened the SHOT blog to as many people as we can, and hopefully you'll be seeing many familiar voices. My plan is to do a lot of photo/comment posting on new products that catch my eye simultaneously to the OC, DRTV and Michael Bane blog from the iPhone on the floor of the Show. In another first, I'm going to try to keep up a running commentary on Twitter, including where I'll be on the Show floor if you'd like to stop me and say, "Hi!" You can go to Twitter and sign up to follow me, or you can read the Twitter updates directly on the OC SHOT page. I have NO FREAKIN" IDEA how this is going to work...if I think about how much work I've committed to do, I'll throw up (probably hit an AR-15, since I expect them to be ubiquitous t his year). Our original idea is to give you as much of a Real Time experience on the SHOT floor as we can, which is why we've set up all this running media. It's ambitious as all get-out, but what else would you expect from us? Tally-ho, so to speak...or, since we're in Orlando, so to squeak! Podcast on THURSDAY This Week! No, it's not sloth...I want to be able to record the podcast LIVE from Media Day at the Range, where we actually get to shoot the stuff! In the language of politics there is only one translation for the phrase "hope and change," to wit, "big, fat government." Mr. Obama, if you're going to give us big, fat government, you need to be a big, fat politician. You need to be a Tip O'Neill, a Teddy Kennedy, a Richard Daley, a Bill Clinton at the very least. And you don't seem to be a big, fat anything--literally or otherwise. You seem to be . . . smart and organized. Like Jimmy Carter! So we may speak without compunction of the failed Obama presidency. What a blessing that it's a failure. Things are bad enough the way they are. There's already a huge ongoing government intervention inthe economy. Bringing the government in to run Wall Street is like saying, "Dad burned dinner, let's get the dog to cook." Now the government's going to take over the auto industry. I can predict the result--a light-weight, compact, sustainable vehicle using alternative energy. When I was a kid we called it a Schwinn. And next in line for political therapy is health care. Voting will cure what ails you. Go to the doctor when you've got cancer, and he'll say, "Don't worry. Everything will be fine. I'm going to treat your disease by going inside this small, curtained booth and putting an 'X' next to a very special name." No. Barack Obama doesn't have the outsized personality and flair for bunkum that is necessary to lead even America's sheep-like electorate into such ravenous company. Thank God. I interviewed Ayn Rand years ago, and it was predictably grueling. After my first question, she fixed me with this dark stare and said, "That's not good enough, young man. Try again." Whew! She also gave me one of the best pieces of advice I ever received. We'd finished the interview and the old libertarian philosopher had started out the door. She turned around and came back into the room, where I was packing up. "Young man," she said. "Listen to me. You have one thing to do with your life, and that is see clearly. That is all...just see clearly." And she left. These acts and edicts sound farcical, yes, but no more so than the actual events in Washington, circa 2008. We already have been served up the $700 billion "Emergency Economic Stabilization Act" and the "Auto Industry Financing and Restructuring Act." Now that Barack Obama is in town, he will soon sign into law with great urgency the "American Recovery and Reinvestment Plan." This latest Hail Mary pass will increase the federal budget (which has already expanded by $1.5 trillion in eight years under George Bush) by an additional $1 trillion -- in roughly his first 100 days in office. Read the whole thing...hell, read ATLAS SHRUGGED to find out what's coming! ..frantically trying to get everything up to speed for the trip to Orlando. Basically, I snuck out yesterday to help work on the pilot for a new series, SWAT MAGAZINE TV, which will hopefully make it to OC in Q1 2010. THE BEST DEFENSE (TBD) co-host Rob Pincus will be doing the heavy lifting. I have minimal Executive Producer involvement, but I definitely want to get the show off on the right foot. 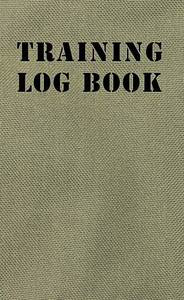 BTW, Rob's nifty TRAINING LOGBOOK (pictured above), a hardback way to keep tabs on your own training and featuring essays on training from Rob, Mike Janich, Tony Blauer, Clint Smith, Dave Spaulding, Tiger McGee, Marty and Gila Hayes, John Farnam, Tom Givens, Wes Doss, Andy Stanford, James Yeager and Yours Truly. We'll have the LOGBOOK available on DRTV after SHOT. I have to spend all day today working on the outlines for the TBD: SURVIVAL! series you'll be seeing in July. Turns out being a TV Magnet (as in "Refrigerator Magnet") is a lot of work. Americans are purchasing firearms and ammunition in record numbers, not because they believe 2009 will offer unusually good duck hunting, but because they fear the fallout from the coming economic storm and the state’s reaction to that fallout. The larger question is: how many of those who have gone out and purchased firearms and ammo will actually use them? I believe a large number would bring those weapons to bear against criminals who would steal and threaten their families and property, but, how many would use them against the criminal state as it moves to seize their weapons, as was done in New Orleans, when the next "emergency" occurs, be it an economic meltdown or terrorist attack? HMMMMMMM...inquiring minds wonder whether Cerberus Capital Management has finally found its long-sought handgun dream date??? Okay, this is the last story, and it's here out of fairness. I spoke with Mike Baker, one of the owners of Cannon Safes, over the weekend. Obviously, he isn't a happy camper and there were some tense moments...but all in all it was a relatively cordial conversation. I told him I would give him his say on the blog, because that's only fair. Mr. Baker says quite emphatically that Cannon Safe met the letter of its warranty agreement. Locks are only warrantied parts and labor — as a couple of my commenters have noted — for one year. By sending me the replacement lock, Cannon fulfilled their warranty to replace products with a manufacturing defect, even though they did not manufacture the lock. Mr. Baker also says that "99.999999%" of the people who call Cannon customer service do not have the experience that I had. He pointed out that his company had recently received awards from retail organizations. He stated that perhaps if I had not demanded special service I would not have drawn the ire of the customer service representative. He also stated that he did not know that I had not only asked for special service, but offered to pay for it in full up front. He stated the LP lock provided to me actually has a highly level of security than the KABA lock currently on the safe, and that electronic locks in general have a better security rating than mechanical locks. Mr. Baker also said that his customer service representative apparently misspoke — a locked safe did not have to be drilled to be opened, and that he would contact me with a solution on Monday. Good to his word, he called today with the name of a locksmith in Denver who would be receiving an electronic safe opening tool via UPS from Cannon which would allow them to open my safe and replace the lock. I told him that had his customer service representative said that to me more than a week ago, we would have never had our little imbroglio. Should I have done this first? I don't believe so...safes are expensive, ostensibly lifetime investments, and I suspect it's better to have experts work on them than ham-handed (and lucky) amatuers. I used heat sinks, but it's a crap shoot on a small circuit board...you're always risking heat damage. I'm still going to replace the lock — with a mechanical one if I can, or a top-of-the-line electronic if I can't. I will be returning the LP lock to Cannon...and I'm going to be buying a new safe at SHOT because I need the room and, in truth, I've lost a lot of faith in this one. 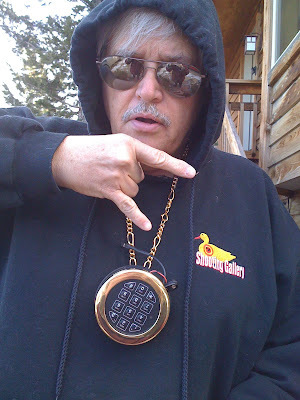 I am thinking of a different safe strategy, however...instead one one big one with all the eggs in one basket like I have now, I'm thinking of a couple of smaller ones, which I can stage in various places in the house (upstairs; main floor; old safe in basement). Always an AR at hand, as it were. Still, I look great in a hoodie, don't I? BTW...Wednesday's podcast will have some thoughts on choosing a gunsafe as well as the skivvy on the new 4.6 X 30 revolver to be introduced at SHOT! Apparently I was wrong in my thinking that the Dems had been burned enough times on the gun issue that they'd wait until at least after the 2010 midterm elections before sticking their toe back into the parana pool. Sources from Washington are telling me that President-Elect Obama may move forward on an Assault Weapons/Magazine Capacity Ban ASAP — maybe as soon as later this January. Despite the new administration's insistence that jobs and the economy will be the top priority beginning January 20, insiders say payback to the NRA and other pro-Second Amendment groups is high on the agenda. Democratic advisors say the Republican party is "disorganized, disheartened, and dissolving" and it's a good time for the incoming administration to take them on in a core issue - the assault weapons ban is one of three topics they're evaluating. If the AWB is chosen, everyone expects a pitched battle with no quarter given. If the attempt to pass this drastically-expanded AWB succeeds, the administration will have proven itself virtually unbeatable in matters of policy. They will also further fracture the Republican party and simultaneously serve notice on any pro-gun Democrats that they'd better get with the new program, too. 1) Obama has taken a beating from the moonbat Left since they learned they elected the third Clinton administration instead of the Messiah; he needs to do something to rebuild his left-wing cred. 2) He has no, or very limited moves, on the economy; he can't raise taxes in the face of this brutal recession; it's awkward to pull troops out of a war that's apparently won; global warming has fallen off the radar as the snow continues to pile up...he needs a big flashy move, and we may well be that move. 3) The Republicans are disspirited and disorganized. 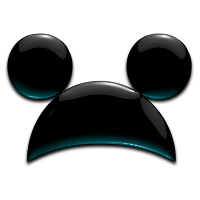 The Blue Dog Dems are less likely to band together this early in his administration against an Obama move, lest they open themselves to a flaying by the faithful. The one Western Dem who might have proved a rallying point, Ken Salazar of Colorado, was tapped to head the Department of the Interior and taken out of play. 4) The gun lobby is as weak now as it is ever going to be during Obama's administration. 5) Obama has the opportunity to woo the few remaining Bush Republicans — remember, Bush always said he'd sign a new AWB — that a new AWB is "common-sense legislation." 6) Sources close to the Obama Transition Team acknowledge that a new AWB would burn a huge amount of political capital, but it will "drive a stake in the ground" to prove Obama means what he says about "change" regardless of consequences. We can assume a huge spin-up from Brady and the VPC, with their fellow travelers in the MSM, leading the charge. On our side, the industry is moving at warp speed to finish preparations for the upcoming fight. At the very least, this is going to cost a fortune. If you are not now a member of the NRA, join. And be ready to open your wallets...yes, there's a recession and we're all hurting, but that is exactly what our enemies are betting on! Vote for the Second Amendment! Americans for Tax Reform is giving us all a chance to submit a question in the debate for a new Republican Party Chairman, scheduled for tomorrow! 1) Unequivocal opposition to any so-called "Assault Weapons Ban." 2) Opposition to any ban on magazine capacity, types of ammunition, etc. 3) Opposition to any attempt to subvert at a federal level state-approved concealed carry laws. 4) Support for concealed carry rights on a national level. 5) RELENTLESS opposition to any federal registration schemes, whether on firearms, ammunition, etc. The GOP has treated those of us "under the tent" because of Second Amendment issues as the "crazy uncles in the closet" for far too long! The GOP must embrace the Second Amendment if we are to embrace the GOP. You can vote for my question (or ANY Second Amendment question) after signing up and clicking on the UP arrow on the lower right hand corner of the question. We MUST have an answer to these questions if we are to continue to support the Republican Party! Enough is enough...if they want our vote, they need to STAND THE HELL UP! Thoughts on the Current Middle East "Conflict"
Read the whole thing, and the links if you have the stomach for it. I always come back to the powerful lines at the closing of Alain Renais's searing documentary on the camps, Night & Fog...as the camera pans across a now tranquil Auschwitz while the voiceover reads, "Who is on guard from these lonely towers to warn us of the coming of the new executioners?" The short version — if you don't want to plod through the math below — eating a pound of wild venison instead of a pound of beef may keep roughly a gallon of gas out of industrial food production. If you figure that the average American eats almost half a pound of meat per day, that's potentially a huge savings of carbon going into the atmosphere (to say nothing of the national security implications of saving oil). "If you think of the average hunter as a guy who hunts around his area, a lot of venison comes from a block away," says Steven Rinella, a hunter and author of "The Scavenger's Guide to Haute Cuisine" and, forthcoming in a couple of weeks, "American Buffalo." He said that as a kid, he used to bowhunt deer right around his house, "before anyone had any idea about this 'eating local' garbage." Yes, "eating local." That would be the premise that an eater — e.g., you and everyone you know — can conserve natural resources almost passively, simply by eating food produced close to home. Pick the farmer's market blueberries instead of those flown in from Chile, the thinking goes, and you spare the Earth a heapin' helping of exhaust fumes. "America’s most precious metals are Gold, Silver, and Blued Steel." More Fun with Cannon Safes! These traits seem to be falling by the wayside in our current business climate. All too often, the news of another misrepresented product, stock, or business deal is in the headlines. That's the only way to explain the replacement "lock" they sent me. If you recall, when I talked to their humorously titled "Customer Service Department," the wonderfully responsive "knowledgeable service technician with the authority to fix any Cannon Safe issue on the spot," said that while I was on my own on getting the safe open, he would honor their "Lifetime Warranty" — those guys! — on manufacturing defects and send me a replacement lock that I would have to figure out how to install because Cannon doesn't care whether I remain a customer or not. He said he didn't have KABA locks — the one that failed — but he would send "an S&G." Those jokers! I thought they'd send "an S&G," Sargent and Greenleaf, a standard safe lock found on almost everyone's safes. But those comic tricksters sent me the bottom-of-the-line LP Lock — a plastic piece of apparently made-in-China crap that you might find on those $29.95 "safes" available from the office supply store. At first, I was taken in...I thought they actually sent me this...toy...as a lock...then I realized the joke...it's an homage to rapper Flavor Flav, whose signature outfit always included a huge clock necklace. While the original failed KABA lock is all metal, weighs almost a pound, is contoured for easy access, blah blah, the "Flavor Flav" Cannon lock weighs in at a "hefty" 2.7 ounces — perfect for hanging on a necklace! — and is genuine, authentic gold-colored plastic! Hot! I've decided to play along with the joke and ACTUALLY WEAR my "Flavor Flav" Cannon at the SHOT SHOW! Get down! YO! What a brilliant marketing plan...selling safes with toy locks you can actually wear and make a fashion statement! 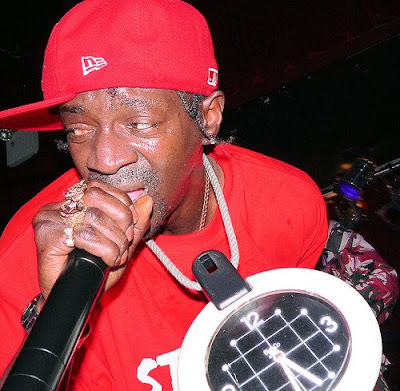 I'm hoping people ask me where they can get their own "Flavor Flav" Cannon Lock for the next Rave! Thanks, Cannon! I can't get my safe open, but I'll look bad to the bone at SHOT!